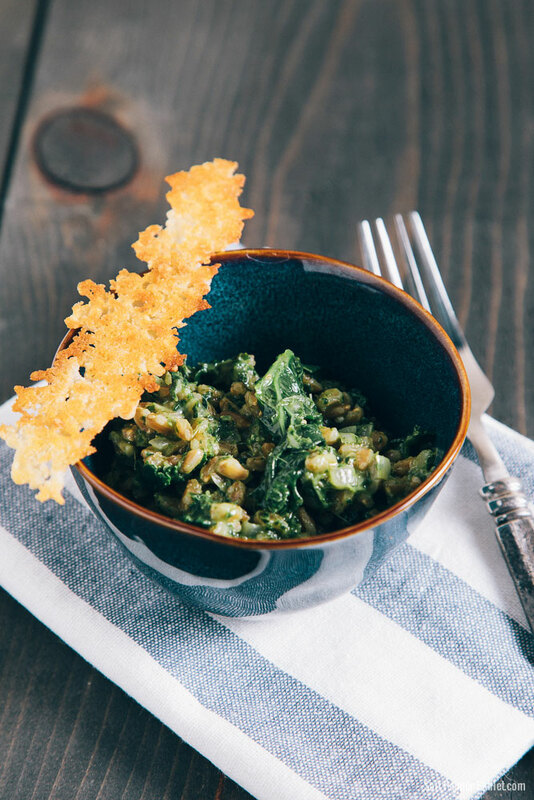 If you have never cooked risotto before, it can seem like a daunting task. While risotto is usually thought of as being made with rice, I think of it more of just the concept of slowing adding boiling liquid a little at a time until the dish is cooked. 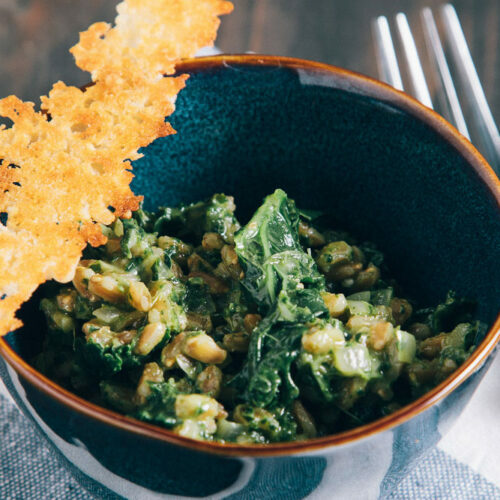 It is traditionally made with arborio rice, which is an Italian short-grain rice. There are many other types of rice, grains (farro being one of them) and even vegetables that can be used with this cooking concept. 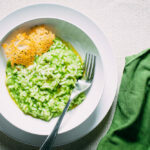 Plain risotto that is finished with parmesan is always good, but I absolutely love risotto that is flavored with a fresh seasonal vegetable that is added in two forms. The first form is a purée of the veggie that has been blanched. This adds incredible color and flavor to the dish. The second form is to add the veggie in a more whole or somewhat chopped state by combining it in at the last minute. 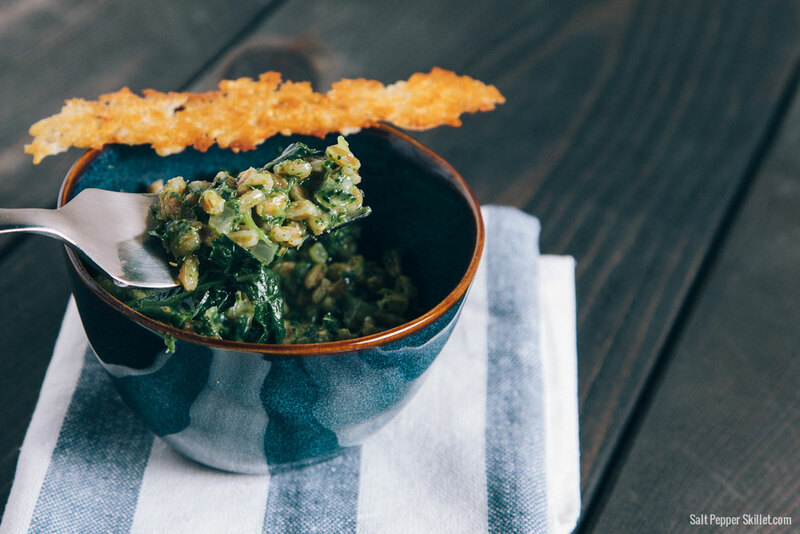 When it’s spring or summer, asparagus is the perfect candidate for this. When you think of risotto, you might think of standing over your pot and stirring for an hour without stopping or being able to look away. This really isn’t the case. It’s much lower maintenance than it might seem. You simply add your hot liquid, stir, walk away, come back, add more liquid, stir, and repeat until the risotto is cooked. Sweat diced onion in a few tablespoons of olive oil until it is translucent. Add the rice/grain with a little bit of salt and stir for a minute or two. Add some acidity in the form of white wine for and stir until it is absorbed.Start adding your boiling liquid (vegetable stock, chicken stock, fish stock or even water can work if you don’t have stock) a little at a time while stirring until it is absorbed. Then repeat until it is cooked (taste frequently). *The process of adding liquid in intervals gives the rice (or whatever you are using) the unique texture when it is finished. 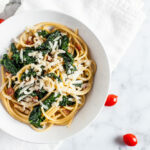 Once it is cooked, you add your finishing ingredients which are usually butter, a little olive oil and a good amount of parmesan, along with the vegetables you might be adding. *Adding the vegetables at the last second keeps the bright colors and flavors. 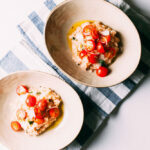 Get creative and just have fun with your risotto making. 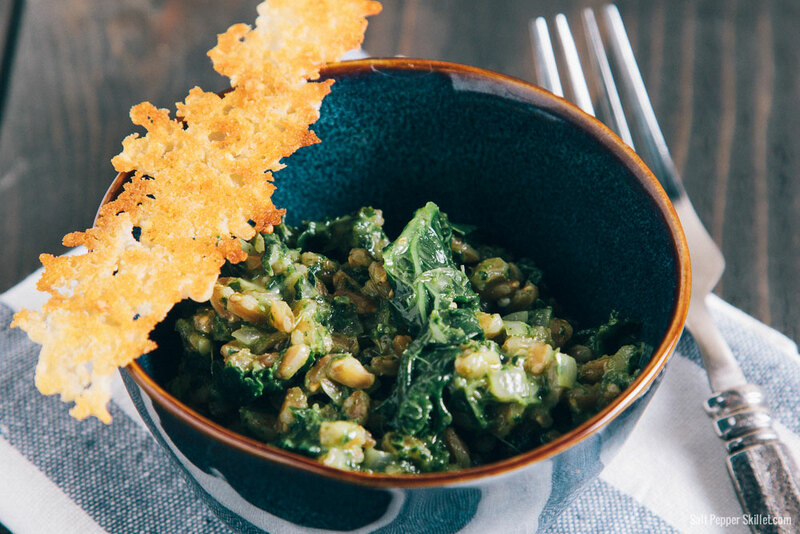 The kale flavors with the farro are so delicious. 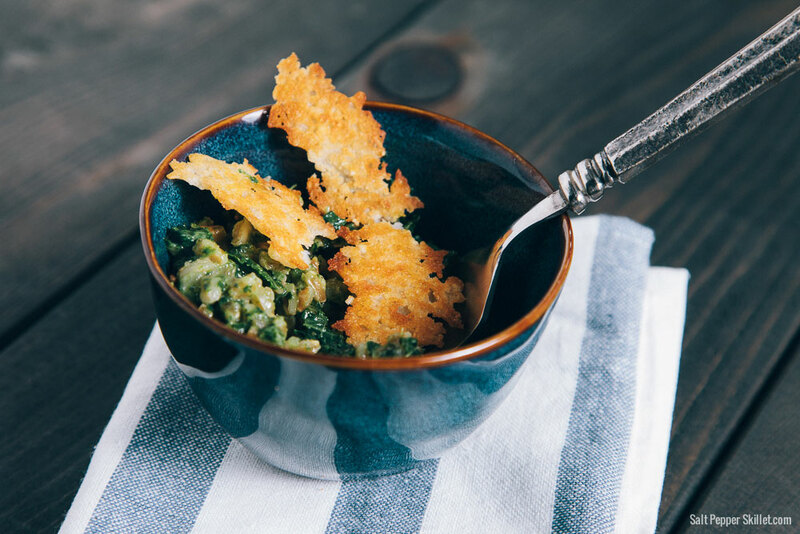 The parmesan crisps are so easy and add a great texture. In a medium saucepan, bring your stock to a simmer. In a large saucepan, heat 2 tablespoons oil over medium-high. Add the chopped onion + 1/2 teaspoon salt. Sweat until the onion is translucent but not browned, about 4-5 minutes. 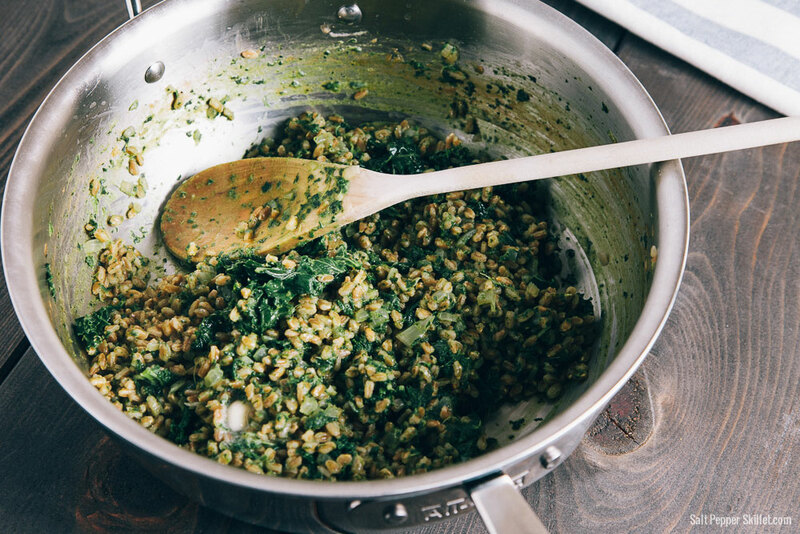 Stir in the farro to the and cook for about 2 minutes to lightly toast the farro. Carefully add the wine and stir constantly with a wooden spoon until the liquid is absorbed. Start adding the boiling stock in 1 cup at a time, stirring ever few minutes until the liquid is absorbed; then add more stock repeating the process until all the stock us used and the farro is cooked (you will need to taste frequently to know when it is ready). Some farro takes longer to cook than others. Combine the grated parmesan and flour in a small bowl. Heat a large non-stick skillet over medium-high and coat with the cooking spray. Sprinkle the parmesan mixture into the hot pan in the shape you want your crisps. Cook for just a few minutes until the the crisps are golden on one side. Remove the pan from the heat and very carefully turn it upside down and run a splash of cold water over the back of the pan in the sink (sounds crazy, but this works). This will cool the pan enough so you can use a spatula and remove the crisps from the pan. Repeat until all your crisps are made. Blanch the kale in a large pot of salted boiling water for 4 to 5 minutes. Shock the cooked kale in an ice bath to stop the cooking and to preserve the color. Drain the water and squeeze the water out of the kale. Add half of the kale and 1/2 cup of cold water to a high powered blender to purée. Beat in the butter, kale purée and chopped kale to warm through. Remove from the heat and stir in the parmesan. Season lightly with salt + pepper. This sounds absolutely wonderful! I love those Parmesan crisps! Can’t wait to make this!